The M&S Heritage Stall is now open! We've gone back to our roots and opened a stall in the place where the famous M&S brand first started at Kirkgate Market in 1884. 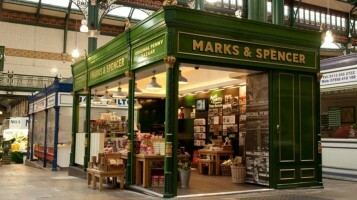 The stall and coffee shop stands right beside the famous M&S clock in the 1904 building of Kirkgate Market. Visitors can learn about the Company's heritage since it started as a penny bazaar in a similar stall. You'll also be able to enjoy an M&S coffee and purchase gifts and merchandise. The new stall launches to coincide with the one year anniversary of the opening of the Marks in Time Exhibition at the M&S Company Archive. The collection, which was unveiled here at the University of Leeds Michael Marks Building in March 2012, details the history of the development of the world famous retail chain to the present day. Make sure you pop by and have a look! Here's the full Yorkshire Post article.